Eve "Alex" Barclay is a Dublin-born crime fiction writer. She won the Ireland AM Crime Fiction Award at the Irish Book Awards for her third novel, Blood Runs Cold (2008). This marked the beginning of the Special Agent Ren Bryce series, based in Colorado. 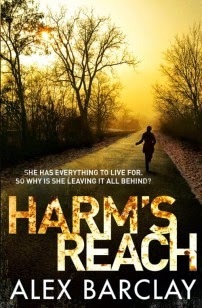 Since then, the bipolar female FBI agent has featured in Time of Death, Blood Loss, Harm's Reach and the latest instalment, Killing Ways (2015). Barclay grew up in Bayside in north Dublin. She studied journalism at college, and worked as a journalist and copywriter before writing her first novel, Darkhouse (2006), a Sunday Times Top Ten bestseller featuring NYPD detective Joe Lucchesi. This was followed by a sequel, The Caller (2008). She moved to Castletownbere in west Cork in 2007.